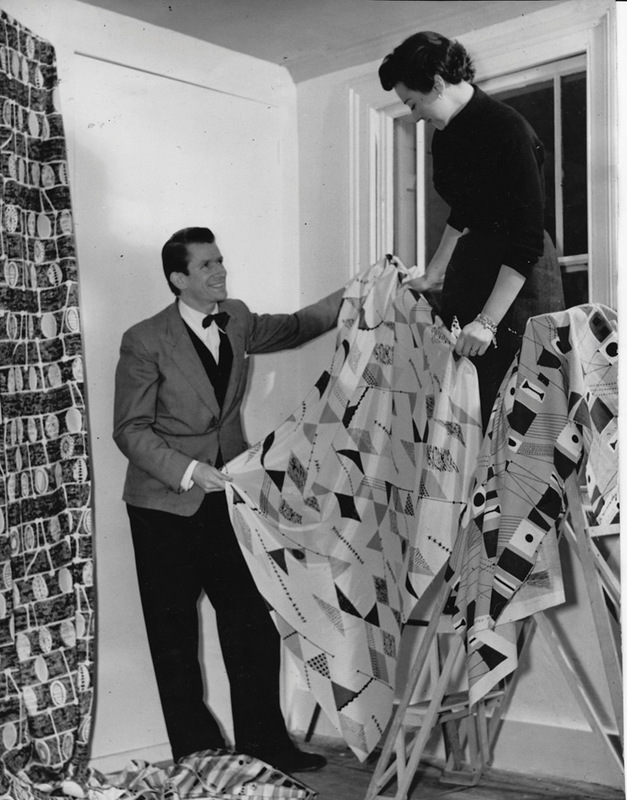 Lucienne Day is well known as one half of Britain’s most celebrated, and most glamorous, designer couple, the Days. 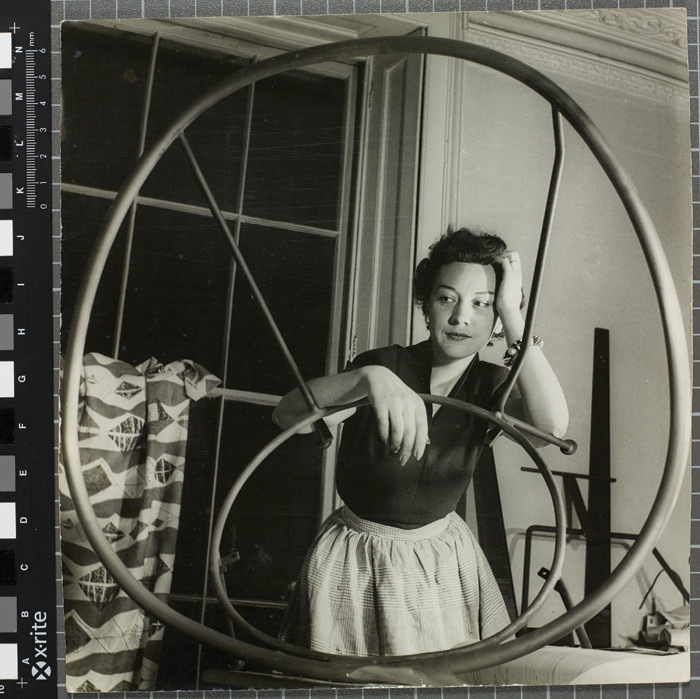 But while the power of the couple was instrumental in their image-making, Lucienne showed a determination to be recognised as an independent designer. She was the first textile designer to have her name printed on her fabrics and helped shape the practice of design into what it is today. As a year-long programme of events and exhibitions kicks off to mark the centenary of her birth, we reflect on her legacy. A glamorous Smirnoff advertisement of 1955 pictures an elegant Robin and Lucienne Day nonchalantly poised for the camera. Casually leaning back on a dark wooden panel, next to the reclining chair he designed in 1952, Robin looks suave in a mismatched suit and dapper, red bow tie. Lucienne pokes out from behind the abstract set, stylish in a bright blue polo neck. The rhythmical pattern of her striped, yellow Trio fabric drapes across the scene. 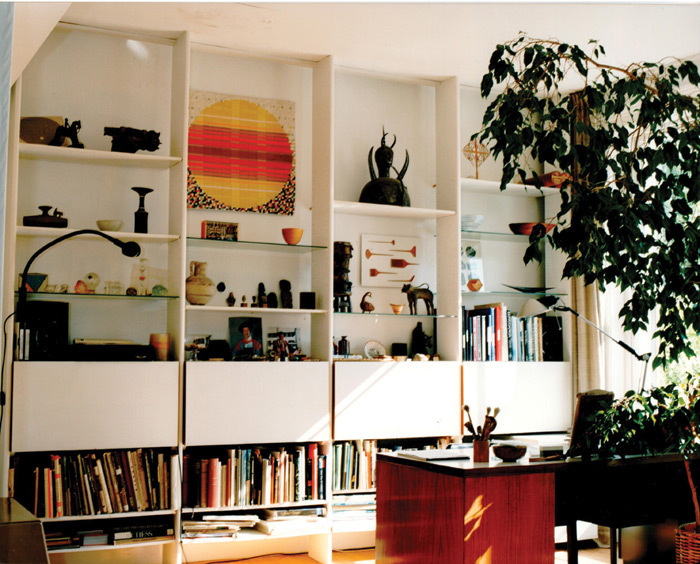 Below, it reads, ‘When not actively engaged in designing highly individualistic furniture and textiles, Robin and Lucienne Day are apt to be entertaining visitors from Europe or America. For this purpose they both agree that Smirnoff Vodka […] is an offering which is invariably accepted with alacrity.’ Here, the gloom of wartime austerity has been shrugged off and in its place is an optimistic, aspirational, 1950s vision of contemporary style and comfort, of vibrant colours and bold, new ideas. This was Britain’s first celebrity designer couple — an influential husband-and-wife team that helped champion a monumental, post-war change in domestic tastes, transforming the face of British design with the belief that good design for the many could improve the lives of ordinary people. In many ways they were Europe’s version of the Eameses. But unlike Charles and Ray Eames, they rarely worked on projects together. For nearly 50 years they worked opposite one another in the same London studio, Lucienne on bold, abstract textiles and prints, Robin on mass-market stacking chairs and low-cost, versatile designs. Yet both were matched in their creative achievements and recognitions. Lucienne was not simply the woman behind Robin, as it might first appear in the Smirnoff ad, complementing his furniture with pretty patterns and feminine finishing touches — she was a hugely successful designer in her own right, amassing a staggering body of work over her long, distinguished and independent career. 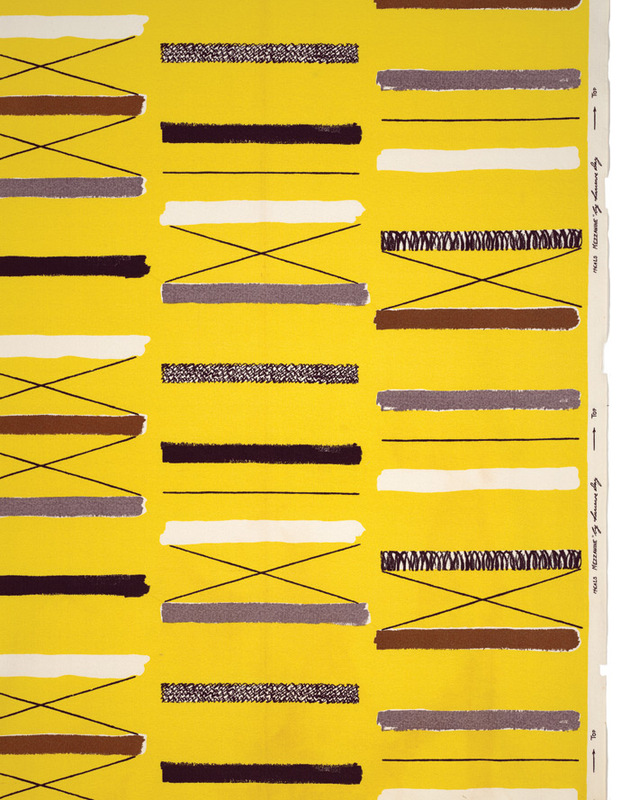 She was the first textile designer to have her name printed on the selvedge of her fabrics, and through her determination to be recognised as an individual talent, helped the practice of design emerge in the post-war period as the profession we know it as today. Her varied output is being celebrated this year with a host of countrywide exhibitions, talks, workshops and product launches for the centenary of her birth. In an era when it was not believed that women could truly have it all, Lucienne was a pioneering professional, managing both the running of the studio and supporting her husband’s career, employing staff and looking after the home, while also finding time to travel the world and promote her own designs. Lucienne Conradi was born in Coulsdon, Surrey in 1917 to a prosperous, middle-class family. She showed an early talent for drawing and studied at Croydon School of Art and then the Royal College of Art (RCA) in 1937, specialising in printed textiles. ‘I never wanted to be a painter, because painting in a way is for oneself and I suppose even then I was a practical person. If I did anything in that line, I wanted it to be useful,’ she told BBC2’s The Late Show in 1993. Lucienne and Robin first met at a dance at the RCA in 1940 when she was 23. He helped design her diploma show stand, suggesting that she upholster one of his armchairs in one of her own fabrics. The display proved so successful, the V&A bought one of her fabrics, a screen-printed linen with a horse’s head motif, for its collection. The Second World War then broke out and the design scene was put on hold. Lucienne was offered an extra year at the RCA, but preferred to stay in London when the school was evacuated to the Lake District. ‘They married in 1942 and moved into a flat off the King’s Road. Her father thought they were mad because they were still in the Blitz but she said that if they were going to make anything of their design careers they needed to be in London,’ says Paula Day. Lucienne began work as a telephonist for the Croydon Auxiliary Service, while teaching jobs at art schools provided a stopgap for them both until the war ended. Until the end of the war, there was hardly such a thing as a professional industrial designer. Manufacturers employed contracted staff and anonymous, in-house designers, who had little or no control over how their designs were used, while glamorous, international reputations were reserved for architects and artists. It certainly wasn’t the established career path for a woman, as Lucienne says in a 2005 lecture, reprinted on page 75, ‘When I left college in 1940, the idea that designing textiles could be a viable way of making a living was quite absurd, and yet — that was what I was trained for and that was what I was determined to do eventually.’ The Day’s set out on freelance careers, both sharing a desire to create accessible, affordable modern design for the masses. While designs of the time comprised dark, heavy cabinetry and fussy, decorative florals, Lucienne and Robin sought to bring a lightness and simplicity to people’s homes. 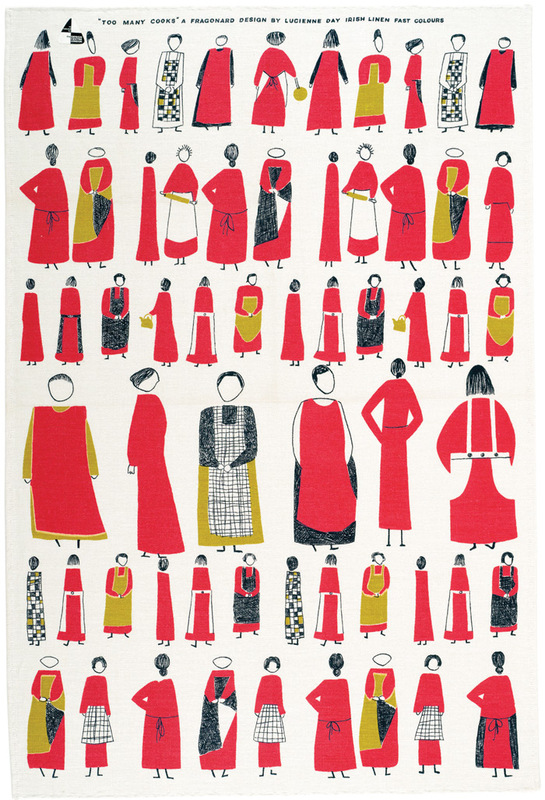 Traditionally, aspiring textile designers would travel up to the Manchester mills with a croquis or sketch design, which would then be sold to a manufacturer and the colourways set out by a staff team. Lucienne preferred to present fully workedup designs, specifying colours and even working out the pattern repeats. Early commissions consisted of fairly conventional chintzes, designed to appeal to the conservative market of the time, such as the delicate, pink and crimson flowers of Fluellin, produced for Heal’s in 1950. Following the couple’s first trip abroad to Scandinavia, they returned inspired for the Festival of Britain in 1951. 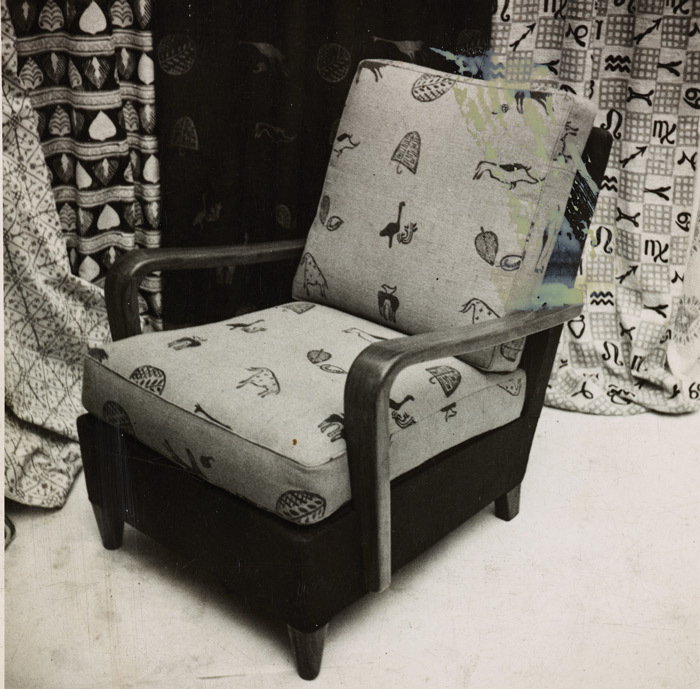 Robin was tasked with furnishing two rooms in the Homes and Garden Pavilion and Lucienne worked up a new, boldly modern fabric called Calyx for them, asking Heal’s to print it for the show. Unlike anything else the public had seen or had in their homes, it’s an abstract floral pattern made up of cupped forms and lively lines, originally in olive green with vibrant yellow, red, white and black, that portrays some of the gaiety and innovation at the heart of the festival. ‘After six years of war and austerity of all kinds, everyone was ready to let rip, curiously all in the same kind of way, going overboard with masses of colours and new ideas,’ Lucienne reminisced in 2005. Heal’s was initially skeptical that such an abstract print could ever be commercially successful, but the design won a Gold Medal at the Milan Triennale and an American Institute of Decorators award in 1952, the first time the accolade was presented to a British designer. 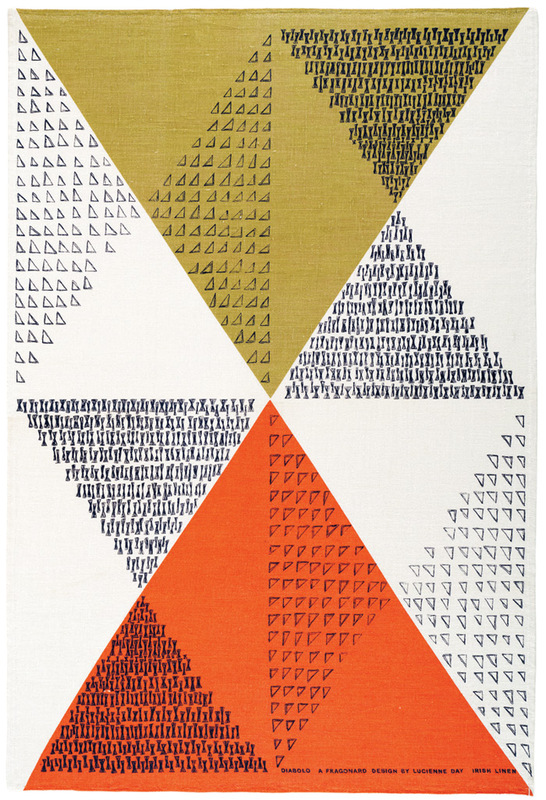 Lucienne went on to produce half a dozen designs a year for Heal’s over the next 20 years, alongside patterns for Liberty, Edinburgh Weavers and British Celanese. The 1950s was one of the busiest periods of her career and at the same time, Robin had won a MoMA competition for low-cost furniture design in 1948 and found his own career flourishing with Hille as a committed client willing to support young talent. Helping define a revolution in public taste, Lucienne’s designs of the time are wonderfully free and playful, with rhythmical motifs, abstract plant forms and later black, inky lines, a world away from the staid designs of the Thirties. 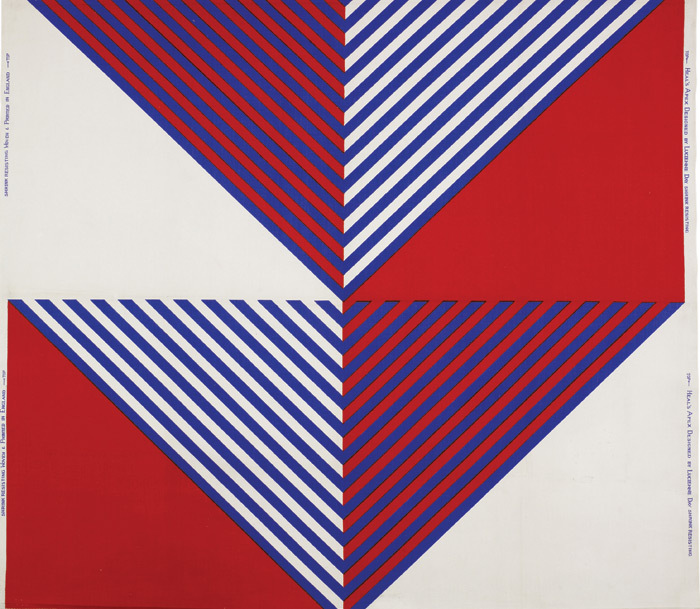 ‘She was hugely influenced by modern art — Paul Klee, Miró, Giacometti — then in the Sixties, Bridget Riley,’ says Paula Day. ‘I think that also had an influence on the seriousness with which she took textile design; she saw herself in the context of great artists and the world’s great decorative art traditions.’ Lucienne would start by painting designs or cutting and pasting coloured tissue onto white paper. Once a design was finalised it was passed on to an assistant to work up colours. The duo soon became household names, appearing in glossy lifestyle magazines and contributing to programmes about design on the BBC. Early black-and-white press shots show a very sophisticated Lucienne, with perfectly coiffed hair, painted nails and immaculate outfits, mainly in all black. Homemaking was central to her identity and she recognised the power of being seen as this golden couple, presenting a picture of domestic bliss that could appeal to aspirational, young women looking to furnish their own homes. Their home and studio at London’s Cheyne Walk was the perfect backdrop to display their design aesthetic, hosting potential clients and providing a ready-made set for shoots within its Scandinavian white walls and modernist setting. The house was Lucienne’s realm and everything was run to the highest standard her daughter remembers. She employed staff for the house and studio, each had an assistant and they shared a secretary. Later Lucienne expanded into wallpaper for Cole & Sons and Crown, and carpet designs for Tomkinson and Wilton Royal. With a growing international reputation, she increasingly worked for American and European clients, including the German firm Rosenthal, for whom she produced patterns for its porcelain for 12 years. 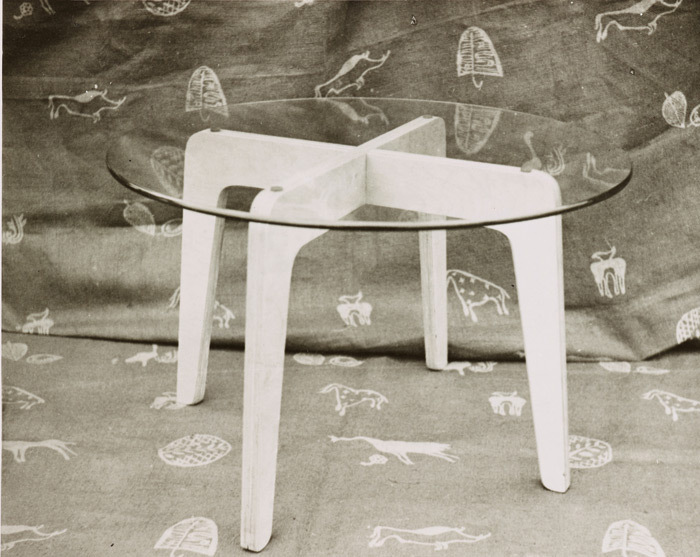 Every summer Rosenthal would run a workshop with the great names in international design, taking Lucienne down the river Nile and to the Alhambra in Spain, while a friendship struck up with Finnish designer Taapio Wirkkala and his artist wife Rut Bryk took the couple to Lapland. ‘That must have been very exciting because you can imagine leaving a house in London, my father and me, all those cares and going off to be a glamorous international designer amongst all those names, mainly all men, from all over Europe,’ says Day. In 1974 and now in her early Sixties, Lucienne made the decision to move away from industrial design and start experimenting with what she termed ‘silk mosaics’, one-off, hand-stitched wall hangings made up of hundreds of brightly coloured, small, silk squares, in a decidedly different style to the printed fabrics she had become known for. The fashion for romantic nostalgia in the 1970s didn’t appeal to her and the need to produce a new collection for Heal’s each year for 25 years had taken its toll. 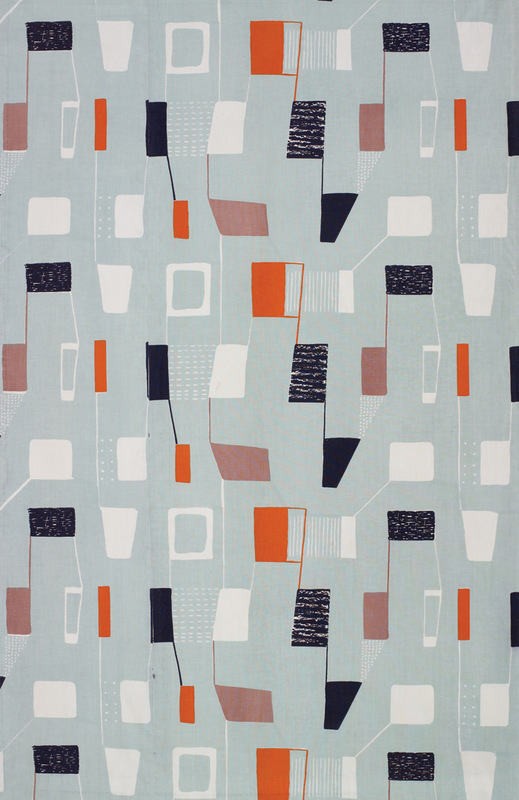 For these more abstract hangings with graphic, geometric motifs, Lucienne would experiment with designs on paper before assistants would handstitch the silk squares together, supporting them on a stiff fabric backing. Once again, for this second, successful career, she found herself pitching for work, arranging exhibitions, talking to journalists and promoting herself, just as she had done as a budding, young freelance designer decades before. She had her first solo exhibition in 1981 at London’s National Theatre, followed by shows in Japan and New York. The Window (1986) was commissioned for the Queen Elizabeth Conference Centre in London, while Aspects of the Sun, a 5m-tall composition of five panels was created for the cafe of the John Lewis store in Kingston-upon-Thames (1990).